It will take as many as 60 flights for Qatar Airways to deliver the 590-kilogram beasts that Moutaz Al Khayyat, chairman of Power International Holding, bought in Australia and the U.S.
Fresh milk production will now start by the end of the month rather than September in Qatar. The showdown between Qatar and its neighbors has disrupted trade, split families and threatened to alter long-standing geopolitical alliances. 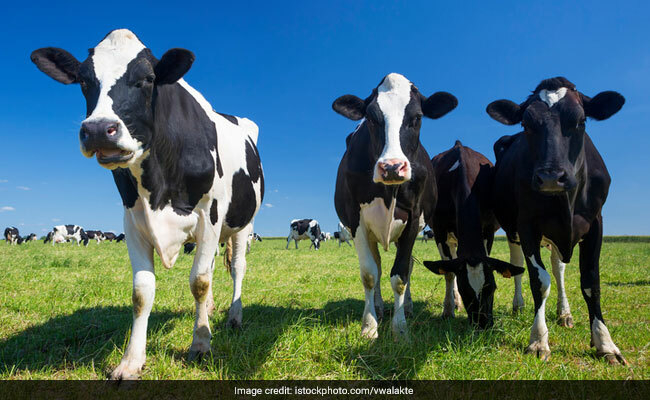 It's also prompted one Qatari businessman to fly 4,000 cows to the Gulf desert in an act of resistance and opportunity to fill the void left by a collapse in the supply of fresh milk. It will take as many as 60 flights for Qatar Airways to deliver the 590-kilogram beasts that Moutaz Al Khayyat, chairman of Power International Holding, bought in Australia and the U.S. "This is the time to work for Qatar," he said. Led by Saudi Arabia, Qatar stands accused of supporting Islamic militants, charges the sheikhdom has repeatedly denied. The isolation that started on June 5 has forced the world's richest country by capita to open new trade routes to import food, building materials and equipment for its natural gas industry. The central bank said domestic and international transactions were running normally. Turkish dairy goods have been flown in, and Iranian fruit and vegetables are on the way. There's also a campaign to buy home-grown produce. Signs with colors of the Qatari flag have been placed next to dairy products in stores. One sign dangling from the ceiling said: "Together for the support of local products." "It's a message of defiance, that we don't need others," said Umm Issa, 40, a government employee perusing the shelves of a supermarket before taking a carton of Turkish milk to try. "Our government has made sure we have no shortages and we are grateful for that. We have no fear. No one will die of hunger." Most of the fresh milk and dairy products for Doha's more than 1 million population came from Saudi Arabia up until a week ago. That milk is getting scarce after the kingdom, the United Arab Emirates and two allies cut transport links with a country that spends $500 million a week to prepare stadiums and a metro before the soccer World Cup in 2022. Al Khayyat, whose main business is a construction firm that built Qatar's biggest mall, had been expanding the company's agricultural business at a farm 50 kilometers (31 miles) north of Doha. Food security is part of Qatar's government strategy to steer the economy away from petrodollars, known, like in Saudi Arabia, as "Vision 2030." Fresh milk production will now start by the end of the month rather than September and will eventually cover a third of Qatar's demand by mid-July, Al Khayyat said at his office in Doha. Facilities for the Holstein cows are ready, though the company will take a hit on the shipping cost for the animals, which increased more than five times to $8 million. "No one in his daily life feels a crisis," Al Khayyat said. "The government is working very hard to ensure there's no effect."